Figure 1. 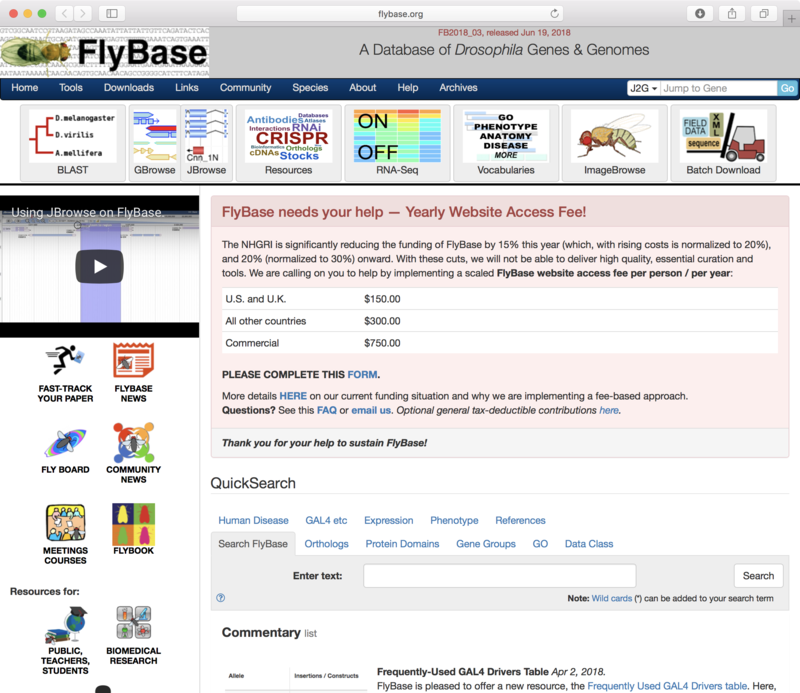 The FlyBase website provides powerful search capabilities across fruit fly linked-data. Their current plight, due to reduction in funding, highlights the issue of how to ensure data access. Yesterday while reading the new research paper on the fully imaged female fruit fly brain (see Largest Brain Comprehensively Imaged at Nanoscale Resolution), I thought back to blog posts I wrote about seven years ago on fruit fly online data repositories, ontologies, and atlases (see “Related blog posts” below). The FlyBase Consortium has been a pioneering organization behind FlyBase and the Virtual Fly Brain; a linked-data repository and visual atlas respectively. They provide a powerful toolset to use with the complete set of fruit fly brain images taken at electron microscope resolution recently released to the public domain. And, in fact, the new data appear to be getting incorporated into release 2 of the Virtual Fly Brain (now in beta testing). Possibilities were bubbling in my mind as I loaded FlyBase. Bubbles froze in mid-mind as my retina relayed the image above (Figure 1) to my cortex. Tools and data repositories we love and depend on may, at any time, become difficult to access or disappear entirely. Any number of factors may be behind restrictions or shutdowns including loss of funding, the retirement of a repository advocate, or a government deciding they should be proprietary. The people at FlyBase clearly had no alternative but to turn to fee-based access to keep their service online. Our global scientific community should seek a solution that eliminates the need to face this choice and ensures global access to foundational tools and data. Science is a global effort. Scientific data should be included, along with scientific knowledge, in the commons for all humanity. Largest Brain Comprehensively Imaged at Nanoscale Resolution (July 28, 2018). A Virtual Fly Brain (April 16, 2011). Viewing the Fly Brain Connectome with Brainbow (February 11, 2011). How the Brain Works, Flies, and the FlyBase Online Data Repository (November 4, 2010). This entry was posted in Brain Science, Open Data, Semantic Web on July 29, 2018 by Donald Doherty. 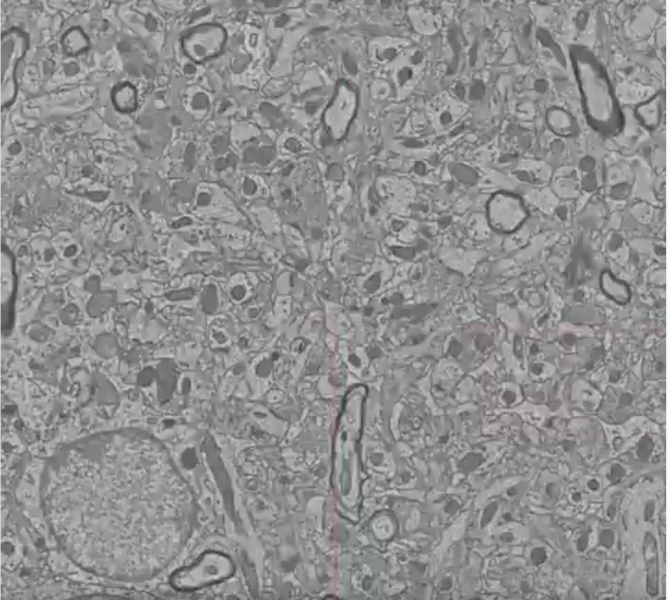 The video above is an excellent quick overview of the comprehensive imaging of a female fruit fly brain at nanoscale resolution. The video was created by the lead research team at Janelia. A fruit fly brain is composed of about one hundred thousand neurons and is now the largest brain compressively imaged at nanoscale resolution using an electron microscope. One adult female fruit fly gave her all so that we may see every one of her neurons and the way they are connected into circuits. Details were published a couple of days ago in “A Complete Electron Microscopy Volume of the Brain of Adult Drosophila melanogaster” (published July 26, 2018 in Cell). A Virtual Fly Brain April 16, 2011. This entry was posted in Brain Science on July 28, 2018 by Donald Doherty. Brains make sense and perceptions from the signals that flow through them. Can we identify elementary neural “wiring” configurations and interactions that help us to understand how brains accomplish this feat? Figure 1. A 40 nanometers wide slice of mouse neocortex cut from a one cubic millimeter sample. The sample this slice was taken from was about the size of a grain of sand and contained about one hundred thousand neurons with nearly a billion synapses. From the “ Allen Institute for Brain Science” and “The Quest to Unravel The Connectome“. Figure 2. A schematic diagram of currently established elementary circuit configurations. The red triangle represents the cell body of a pyramidal cell. The thick trunk reaching up and ending with two thinner branches reaching diagonally is the pyramidal cell’s apical dendrite. The branches reaching diagonally down from the triangle’s two lower corners represent its basal dendrites. An axon leaves the bottom center of the pyramidal cell to various destinations (see text). 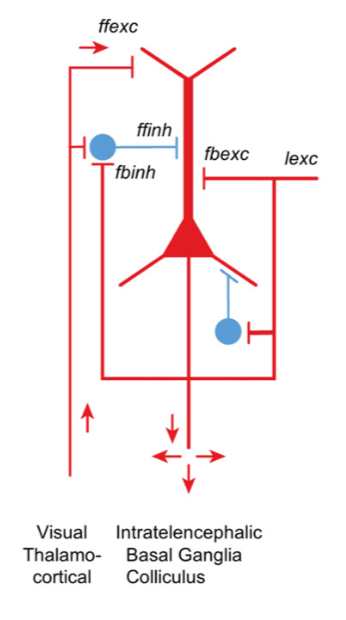 Two other axons (red) enter the diagram. The axon that enters from right comes from other cortical areas. The axon that enters at left from below carries sensory input from the visual thalamus. Two inhibitory interneurons (blue) complete the circuit. ffexc: feed forward excitation, fbexc: feed back excitation, lexc: lateral excitation, ffinh: feed forward inhibition, fbinh: feedback inhibition. Figure 2(A) from “Neocortical Lamination: Insights from Neuron Types and Evolutionary Precursors” published November 7, 2017 in Frontiers in Neuroanatomy. Cortical tissue is packed tight with neurons, dendrites, and axons as illustrated in the electron microscope image of a slice of mouse neocortex in Figure 1 above. To better comprehend this tangle, neuroscientists have worked to identify elementary categories of interactions between neurons and the ways those neurons are wired together. Neurons in cortical tissue can be divided into excitatory and inhibitory cells as in Figure 2 at right (red for excitatory and blue for inhibitory). This schematic diagram shows interactions in the context of elementary connection motifs. The figure is from a recent paper summarizing evidence the mammalian neocortex is an elaboration of a brain area from a common ancestor of mammals, reptiles, and birds thought to have existed about 320 million years ago (“Neocortical Lamination: Insights from Neuron Types and Evolutionary Precursors” published November 7, 2017 in Frontiers in Neuroanatomy). Research on the evolutionary origin of or our six-layered neocortex may provide us glimpses into why specific neuron types or connection motifs provided selective advantages to our ancestors. Evidence from comparative anatomy and physiology suggests that the common ancestor had a three-layered brain region which was lost in birds, remained three-layered in reptiles, and developed into six-layered neocortex in mammals. Layered brain areas in today’s reptiles (turtles) and mammals (mice) that are thought to have a common origin are highlighted in blue in Figure 3 below. Figure 3. The blue highlighted brain regions are thought to have common origins between reptiles (turtle at left) and mammals (mouse at right). Figure S1(A) from “Evolution of pallium, hippocampus, and cortical cell types revealed by single-cell transcriptomics in reptiles” published May 25, 2018 in Science. Single-cell RNA sequencing was used to investigate the evolution of brain regions thought to have common origins (blue in Figure 3) in a study published in Science(“Evolution of pallium, hippocampus, and cortical cell types revealed by single-cell transcriptomics in reptiles” published May 25, 2018). Genetic techniques provide some of the most direct methods available to investigate ancestral relationships among brain tissues. First, scientists pulled sequences of expressed genes from identified neuron types residing in specific regions of turtle and lizard brains. Next they looked in mammalian brains to see where those same gene sequences were expressed and in which neuron types. Figure 4. A schematic diagram of the six layered mammalian neocortex. 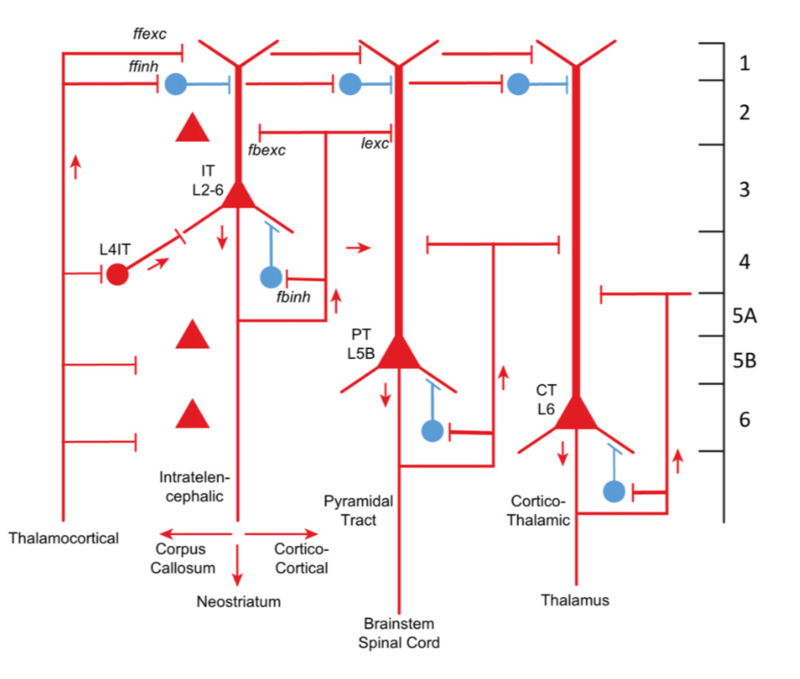 The lamination of the basic circuit with elaboration of the excitatory pyramidal neuron into specialized intratelencephalic (IT), pyramidal tract (PT), and corticothalamic (CT) neurons. ffexc: feed forward excitation, fbexc: feed back excitation, lexc: lateral excitation, ffinh: feed forward inhibition, fbinh: feedback inhibition. Figure 2(C) from “Neocortical Lamination: Insights from Neuron Types and Evolutionary Precursors” published November 7, 2017 in Frontiers in Neuroanatomy. Researchers found inhibitory neurons express similar sets of genes in reptiles and mammals, indicating a common ancestry. In contrast, excitatory neurons differ substantially in gene expression across these two groups. Their results are consistent with Shepherd and Rowe’s idea that three-layer cortex was co-opted and transformed into six-layer cortex through the emergence of new types of excitatory neurons after the ancestral excitatory neurons went through profound changes of gene expression. The basic circuit module seen in the ancestral three-layer cortex in Figure 2 is transformed in the mammalian neocortex into layered versions of the basic circuit with three distinct genetically expressed versions of excitatory pyramidal cells as shown in Figure 4. In summary, recent research has provided a putative common ancestral circuit, the basic cortical module, and three variants in mammalian neocortex. Studies that compare and contrast signal processing in these four circuits could provide insights into how brains make sense and perceptions from the signals that flow through them. This entry was posted in Brain Science on June 19, 2018 by Donald Doherty. HistoricShadyside.org Historic Shadyside neighborhood in Pittsburgh, PA USA. PittsburghInclines.org Many have heard about Pittsburgh’s two famous existing inclines. Did you know that at one time more than 15 inclines traversed Pittsburgh’s hillsides?